The future HR professional will not only have to understand business but also tell compelling stories while being adept at new skills like design thinking and behavioural economics. As per certain estimates the HR technology space is worth $14Billion so it’s no wonder that it attracts a lot of attention and action from multiple players, both new and established. If you want proof of how much attention, take a look at the below info graphic which depicts 540+ HR Tech companies across 17 different sub categories. So what do you see here? HR leaders and business leaders have access to a plethora of HR Tech tools. As per Tracxn HR Tech report, there are more than 700+ HR Tech companies in India alone. The HR Technology space is surely a crowded space with a swath of niches these tools fill. This means, while the overall numbers are high many seems to targeting a very specific niche & hence may not compete directly with each other. While almost all of them indirectly compete with each other. This is very similar to the Marketing Technology landscape as is evident from this 1 super graphic here. What’s causing the HR Tech Growth? The Impact of Cloud & Online Buying Behaviour – Aka Consumerisation. Many employees within organizations have started to wonder why they can’t have the same experience inside the organization as they have outside as a consumer. This has led to many organizations starting to take an “employee first” view of HR processes & technology solutions. Many HR Tech start-ups are essentially born out of this experience as many individuals quit their jobs to create these solutions. 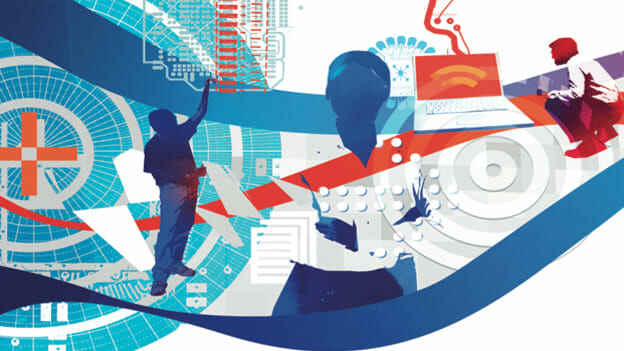 Digitization, Interconnected Direct feedback loops for organizations – As companies started to engage with customers via various direct feedback mechanisms they realised that doing so with current and prospective employees also made a lot of sense. Thus giving rise to HR Technology tools that help companies do this effectively. So What’s happening to the buyer & her behaviour? This large scale of solutions in HR Tech is thus focused on solving tactical challenges than really stepping back and solving strategic business challenges. The buyers would then typically end up comparing “features” of 1 provider to other in such scenario. The tactical focus is also being driven by the very nature of HR organization structure, which has grown to be highly specialized. With a solution set that is now “super-specialized” it’s that much more difficult for HR Tech buyers to look at the complete picture – or take a systems view of things. This explains the recent talk of companies focusing on “employee experience” in their HR Digital Transformation efforts. While this poses a challenge it also creates an opportunity especially for the new entrants, as buyers are not averse to “experimenting” and trying out newer solutions which change categories – success of Workday, Namely and even closer home ZingHR, DarwinBox are some examples of these adoptions of start-up solutions by companies. Here more established players like SAP Success Factors, Oracle, CornerStoneOnDemand and others while enjoying economies of scale may also struggle with diseconomies of scale. However, as buyers move from functions and feature buying to more strategic buying we are likely to see a shift where a clear message and strategic intent arguably with consulting capabilities will determine the right HR Tech vendor. We are already seeing a shift in consulting practices, where it's not enough now for the consulting company to just tell, but its also important for them to be the accountable partner in implementation. With technology increasingly interwoven in the fabric of the organization, consulting companies will have to not only offer critical insights on various technology solutions but also assist the buyer in successful implementation of the same. With this, the boundaries between pure play consulting and technology service providers will start to blur even more. We are already witnessing this with organizations like Accenture, Deloitte and IBM getting in this direction. The other trend that we see today is that of pace of external change is higher than pace of internal change. This is beautifully captured in this graph by Scott Brinker in what he calls as Martec’s law. It's very clear here that a “reset” of organization is hence required after a certain point of time. This is further echoed in Deloitte Global Human Capital trends 2016 report when it states that “ 92% of executives state the need to redesign the organization itself”. As per the report “this new organization is built around highly empowered teams, driven by a new model of management, and led by younger, more globally diverse leaders. As per G2 Crowd Views on Digital Transformation report, about 62% of organizations identified finding and retaining the best employees as one of the top 4 issues that impact business strategy. However in the same report only 42% companies said that they have implemented HR technology solutions for Talent and Performance management. Even the PeopleMatters & SAP Success Factors Report on Digital Transformation in India, does highlight the fact that adoption of Recruitment, Performance Management and HR Operations was highest among other sections of HR technology. Both these data point indicate significant headroom for HR technology implementations. However as identified in the same report the gap between implementation and user satisfaction is high and needs to be focused on by both buyers and sellers. The report also highlights the changing priorities for “integration” in HR technology. While there is talk about AI, bots and robots disturbing the world of HR there is also a growing need for all these point solutions in the landscape to talk to each other. According to Scott Brinker one of the possibilities is for web services like LinkedIn, Facebook, and Google who own huge audience database to take a position and play as primary providers of “software to business”. I see this happening already. LinkedIn’s acquisition by Microsoft and LinkedIn acquiring Lynda earlier it’s quite possible that a unified business suite including all HR needs is rolled out as part of the Microsoft environment. Much like Google play store having various apps which are provided by HR tech solution providers. The day may not be far when we have an “app only” HR technology solution. Facebook is already looking at leveraging its platform for recruitment. Google is piloting an AI plug-in for recruitment technology. Google’s own performance management system is being productized and sold to organizations. The other common trend that we will see between HR Tech & MarTech is use of data as language. By opening up their API’s, technology stacks will allow new technology to plug into their environment seamlessly. This is definitely the next step for HR tech learning from Consumer tech. Companies like Netflix, Amazon, Google and Facebook are already “context aware” and are able to serve their customers in real time, its not long that employees will expect the internal HR technology to be more context aware. Many large HR tech companies like SumTotal, Ramco are already talking about this and it’s safe to assume are in stealth mode on this one. I personally liked the way Mayur Gupta – Kimberly Clark’s Chief Marketing Technologist (Yes! Thats his designation already! ), describes the future marketer – “The Unicorn is a modern marketer who is a technologist. But she is also a storyteller, she is also creative, she is also a copywriter” Thus implying it uses both left and right brain faculties. This is exactly true for HR professionals too. The future HR professional will not only have to understand business but also tell compelling stories while being adept at new skills like design thinking and behavioural economics. There are multiple forces at play even with respect to HR Technology; however after looking at multiple sources and data points, one is convinced that following aspects are more likely to happen than others. Integration, Integration and Integration – Increasingly businesses are going to ask for data, validity and proof. The HR tech investment happening within the HR organization silos will have to start to come together to deliver real business value which is measurable and if it’s predictable that would be awesome. This means that various HR tech solutions deployed in silos will have to talk, share data and help the business and HR leaders not only look at information in hindsight but enable them to make future decisions with certain amount of certainty. HR and HR Tech have to up their game – HR moved from being an administrative function to being a service provider to a business partner. Now both HR & HR tech providers have to look at what difference does the HR technology make to the life of the employee? The challenges of adoption of HR technology will have to be addressed and consumerization of HR tech will be the default. With the increase in computing power of mobile devices, it’s not too long when we see HR processes supported by technology which are app only and make the whole process very simple, intuitive yet accurate for both the employee and the business. Employee first and Employee Experience would be the key words here. Platform-as-a-Service (PaaS)- Many HR technology companies have already started on this path. ADP has a App marketplace, while SAP is looking to leverage HANA cloud platform, Cornerstone has released CornerStone Edge, where smaller vendors can build apps. Yet another example of HR Tech learning from MarTech here would be for all these companies to look at SalesForce for this model. They would also have to be aware of the impending “Collision”. Digitization of business and HR is a journey and companies may take multiple routes to get there. While this would mean category clash within HR tech it would also mean category clash between HR Tech & Martech or even Fintech. This is already happening with Salesforce announcing cloud integration with Workday.